What if I said you could enjoy an indulgent soft cookie for breakfast every morning? 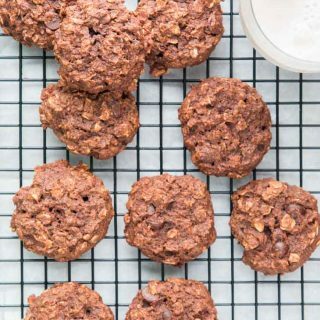 These double chocolate breakfast cookies are made with whole ingredients, vegan, gluten-free, refined sugar-free, and delicious! They’re the perfect guilt-free treat to fuel the rest of your day with, enjoy a snack, or satisfy that sweet craving. This post was sponsored by Bob’s Red Mill, but the opinions and text are fully my own. We all want to eat healthy, especially at the beginning of the year. The push is strong to be mentally and physically fit, which includes eating right. Trust me…I get it because I’m one of these people. But at the same time, we also love to indulge from time to time. I get cutting certain things out to get back on track, such as sugar, but at some point, you wish you could go back to those indulgences without compromising your health and how you feel. I mean…who doesn’t want the occasional cookie, chocolate, or cake… right?? What if you could enjoy cookies every day…and for BREAKFAST! If you had kids, they’d go nuts right?? I’m talking ‘best parent ever award!’ And if you don’t have kids…even better, because then you don’t have to share them with any little mouths! Twice a week for breakfast, my husband makes oatmeal. Very basic…cooked with non-dairy milk, sweetened with bananas, and topped with almond meal and cinnamon. The kids love it, and we love it because it’s healthy and hearty. So I thought why not take it up a notch, change it up slightly, and make a guilt-free cookie based on oatmeal! 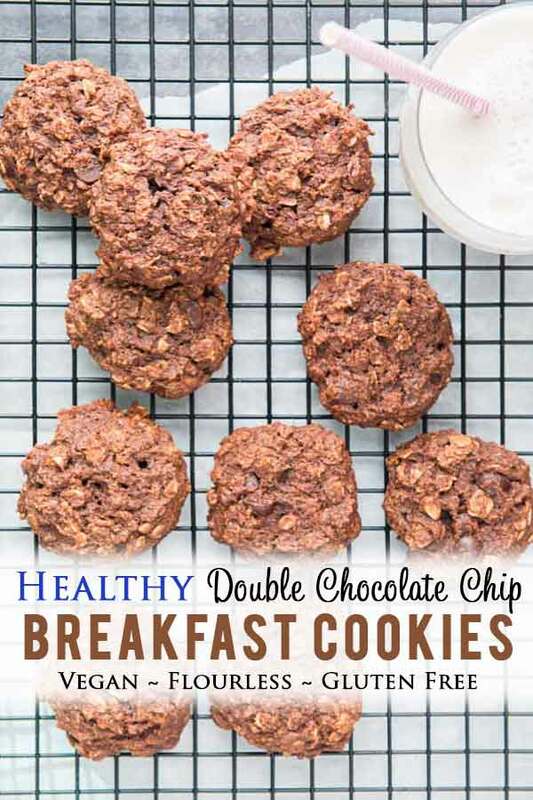 Meet my new Double Chocolate Chip Breakfast Cookies! I named them breakfast cookies because of the ingredients that go into them, but technically you can enjoy these vegan cookies any time of the day. They make for the perfect grab-and-go breakfast, snack, or dessert! Your mornings are sometimes crazy, and there’s not always time to make breakfast, let alone sit down for a bowl of oatmeal or cereal. You set out breakfast only to find out an hour later that your kid has taken only ONE bite. Not only did they waste food, but they also went to school with an empty stomach (which I try to avoid for the sake of their teachers). You’re tired of eating the same thing every morning. You have picky eaters…somehow they refuse to eat a bowl of oatmeal, but put it in cookie form, and they’ll not only scarf it down but beg you for more! You pick up breakfast on the way or grab it at work. But more often then not, you’re tempted to pick up something unhealthy or filled with refined sugar, which isn’t a great way to start your day. You’re craving something indulgent in the morning, but it’s a weekday and you want to stay healthy. These vegan breakfast cookies are your answer!! And who says they can’t double up for a snack or dessert. They make the perfect grab-and-go for all those afternoons filled with sports, or when you get that craving for something sweet! My kids are constantly asking for cookies after dinner. Many times they get offered fruit or a piece of dark chocolate, but when I have a batch of these on hand, they can eat away at their heart’s content (assuming of course that they ate dinner first, ha)! I’ve even baked a double batch of these for travel since they stay great for a few days, making them an easy choice for the airplane or hotel room. Ultimately…do you really need a reason to eat a double chocolate chip cookie? Nope…especially when they’re healthy and made with whole ingredients. If you want to feel good and healthy, you have to eat right. And eating right starts with the ingredients we choose. While developing this recipe, I made sure it was one you’d feel really good about, and that it’s full of clean whole ingredients because that’s honestly where healthy eating starts. Not just specific ingredients, but also the quality of those ingredients and how they’re made. 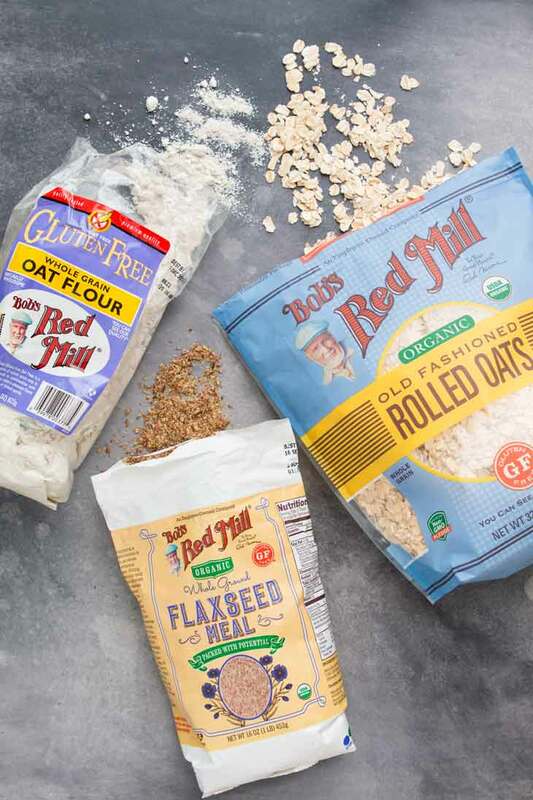 One of my favorite brands when it comes to choosing ingredients is Bob’s Red Mill! We’ve been using Bob’s Red Mill for as long as I can remember because of the quality of their products. Instead of using high-speed steel rollers, they use quartz millstone that grinds at slow speed and cold temperatures. Their process ensures that the nutrients and flavor of the grains are preserved. Bob’s Red Mill provides the best certified gluten-free products. They have a separate 100% gluten-free facility and tested using their strict gluten-free protocols. This alone has made a world of a difference when baking and cooking for my brother, who has Celiac disease. My pantry is stocked with their products…things like ground flax seeds, spelt flour, brown rice flour, whole wheat flour, oat flour, and nutritional yeast. We even have their big huge bags of steel cut oats on subscription order from Amazon every month. Their ready-to-go healthy oatmeal cups are PERFECT for travel! 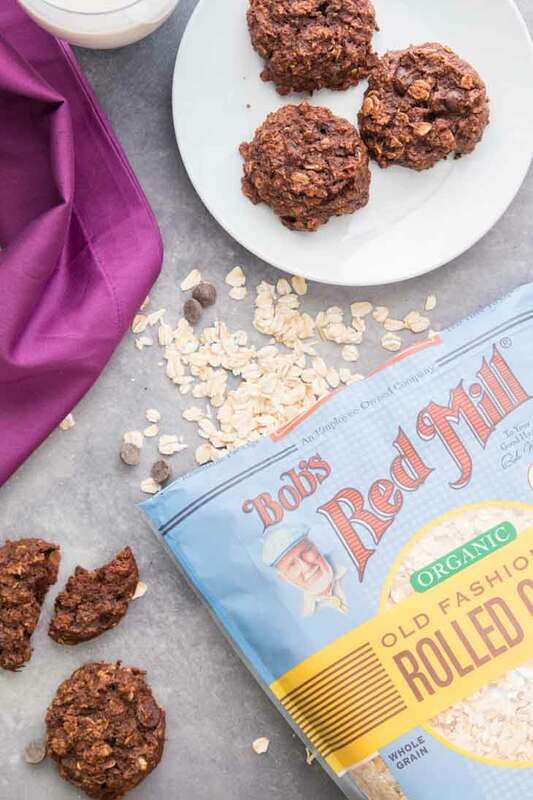 From the beginning, Bob’s Red Mill has always been a brand we could trust and one of our go-tos when it comes to choosing ingredients. So when you collaborate with a brand that already stocks most of your pantry, you know it’s a natural perfect fit! 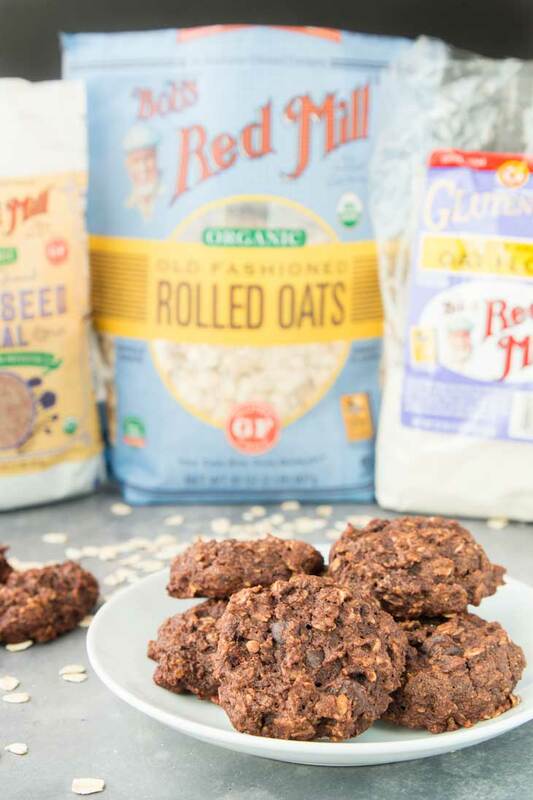 These healthy vegan breakfast cookies use some of my favorite Bob’s Red Mill products that are staples in my pantry. What Makes These Breakfast Cookies Healthy? 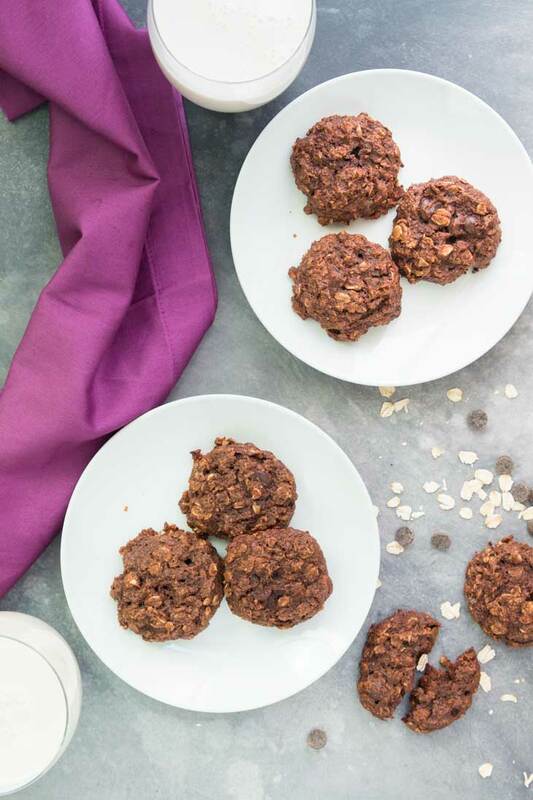 The base for these vegan cookies is oats, oat flour, and ground flax seeds, which all provide healthy good fats, protein, fiber, and many other nutrients. Aside from the chocolate chips (which are optional, but highly recommended), they are sweetened with mostly fruit and a little maple syrup. Some healthy fats, good carbs, no refined sugar, and protein! They’re rich, delicious, soft, and chewy, and make for the perfect all-purpose cookie! These healthy chocolate chip cookies come together quickly. 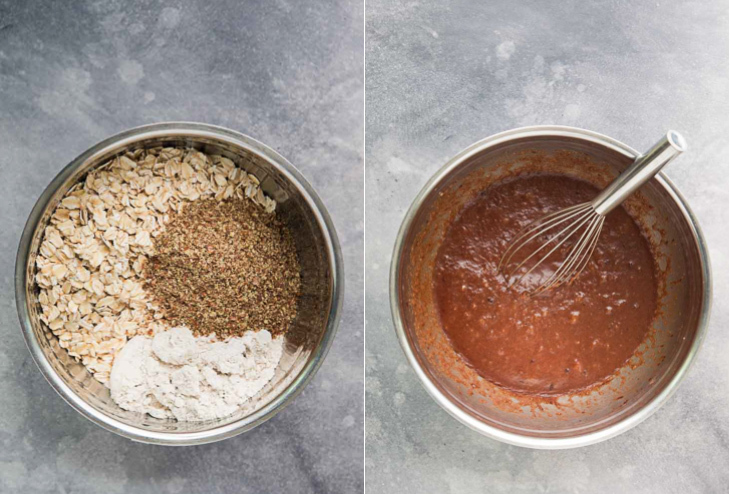 In two separate bowls, mix together the dry ingredients and wet ingredients (with the exception of cocoa powder, it goes into the wet ingredients). Slowly add the dry ingredients into the wet ingredients and combine with a spatula until just mixed. Add in the chocolate chips and chopped nuts (if using). Combine and let the batter sit for 5 minutes. Scoop out the dough using a cookie scooper and place on baking sheet lined with parchment paper. Using the flat side of two fingers, slightly flatten each cookie. Bake in the oven, let them cool, and keep your eye on them because those sneaky small mouths tend to linger around the kitchen when they smell a batch of these coming out of the oven! 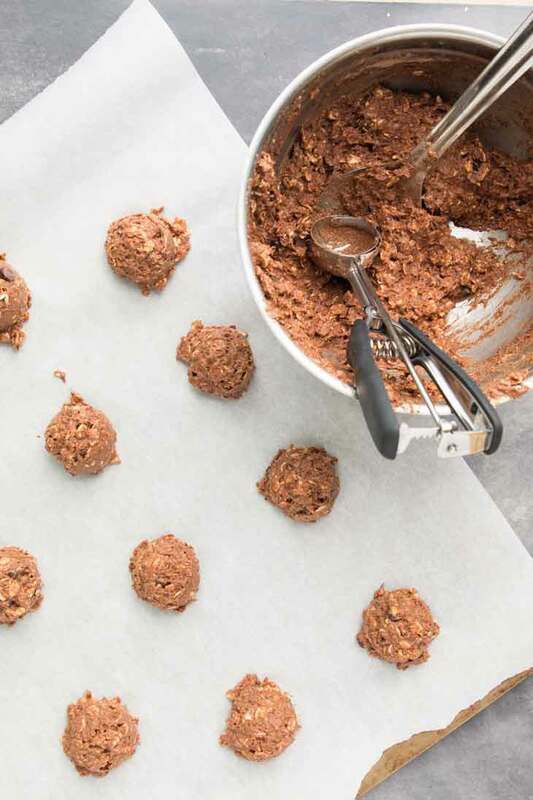 These breakfast cookies are delicious and guilt-free. Something you could grab to fuel the rest of your day with, enjoy a snack, or satisfy that sweet craving. So what are you waiting for? Grab some good quality ingredients and get baking! And if you’re not a chocolate fan, try out my these blueberry or pumpkin breakfast cookies instead! If you like this recipe or post, be sure to leave a comment and use the rating field! You can also tag me on Instagram with any re-makes, @vegetariangastronomy so I don’t miss it, as I love sharing them on Re-Make Fridays! Or you can help me spread the word about my recipes on Pinterest and Facebook! What if I said you could enjoy an indulgent soft cookie for breakfast every morning? 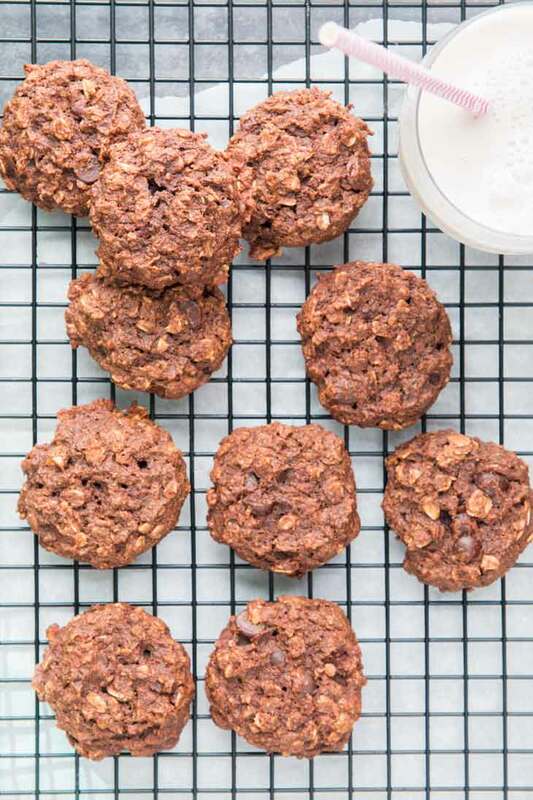 These double chocolate breakfast cookies are made with whole ingredients, vegan, gluten-free, refined sugar-free, and delicious! In a mixing bowl, combine all the dry ingredients listed above. In another larger mixing bowl, combine all the wet ingredients. Add the dry ingredients into the wet ingredients and mix until JUST combined (be careful not to over-mix the batter). Add in the chocolate chips and chopped walnuts (if using). Let the batter sit for about 5 minutes while you line a baking sheet with parchment paper. Using a cookie scoop, scoop the dough and release onto the lined baking sheet. Space them about 1-2 in. apart. Then using two fingers, gently press down a little to flatten slightly (the cookies will not spread as they bake). Bake for about 15 minutes, or until the top of the cookies are set. Take the baking tray out of the oven and let them cool on the tray for about 5-10 minutes. Then transfer the cookies to a cooling rack and let them cool completely. Note that the cookies will continue to finish cooking while they are cooling. Once cooled, store in an airtight container. Enjoy them for breakfast, as a snack, or for dessert throughout the week! Nutrition Facts - include the addition of vegan chocolate chips and walnuts. 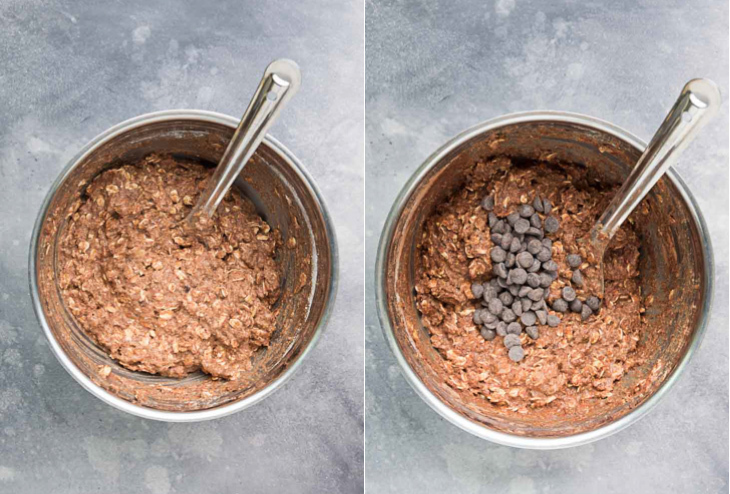 For a completely refined sugar-free recipe, omit the chocolate chips. You can try freezing these cookies for quick make-ahead breakfasts (I've never tried this, but it should work fine). Thanks Adriana! Agree with all of what you said! Thanks Cathy! These are definitely very moist and guilt=free! This is my kind of recipe! I was excited to make these because I had all of the ingredients on hand and they were easy and so yummy! Thanks! Awesome! Thanks glad you loved them! Haha...yes then this recipe is PERFECT for you! Cookies for breakfast everyday!